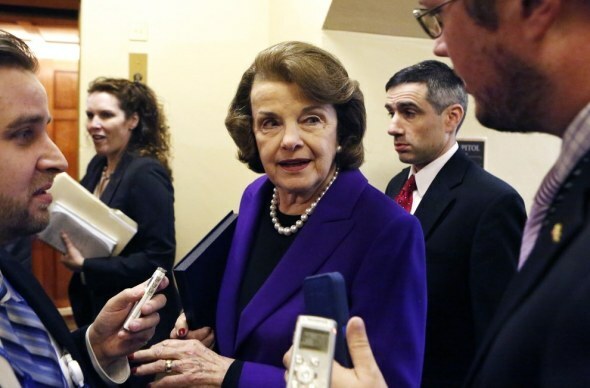 Senate Intelligence Committee Chair Senator Dianne Feinstein, Democrat-California, on Capitol Hill in Washington, Tuesday, December 9, 2014. (by David French, National Review) – To read the some of the more liberal quarters of the Internet today — from the New York Times, to Andrew Sullivan’s blog, to The Nation, and beyond — you would think that the United States is now a virtual criminal enterprise, run by war criminals, harboring war criminals and committing war crimes as a matter of national policy. You would think American national honor has been stained forever. And you would know that the American story told by the Left, one dominated by stories of American crimes (real and imagined), will now include a new chapter — the torture era. And that leftist story will be partisan, ideological nonsense. That’s not to say that there isn’t real wrongdoing detailed in the Senate Democrats’ so-called “torture report.” For example, a detainee likely died from hypothermia after being chained to a wall without pants. There’s no legal justification or excuse for such an incident. Nor do some of the other activities described seem to meet any reasonable standard for proper forms of enhanced interrogation. But these worst of incidents were extraordinarily isolated. In a war where we’ve taken tens of thousands of detainees, the numbers implicated by the worst aspects of this report seem to be less than ten. To put this in some perspective, during World War II American and British forces indisputably treated German and Japanese prisoners of war far better than the Nazis and Imperial Japanese treated our own men, but the death rate for Axis prisoners in American custody far exceeded that of contemporary conflicts, and there were many, many reported instances of allied soldiers shooting prisoners. And those abuses largely went unpunished and — unlike here — were accomplished for no discernible intelligence purpose but rather as acts of reprisal or impulsive fury when faced with Nazi or Japanese atrocities. And that brings us to the next bit of perspective. To read the Left, one would think that the CIA was staffed by pure sadists, who simply abused prisoners for no purpose. Again and again they parrot the line — as if it’s indisputable, gospel truth — that we never obtained any intelligence advantage from enhanced interrogation. Yet the committee’s minority report disputes this in detail, as does the CIA’s response, and as do three former directors of the CIA. The reason the Left clings to the notion that enhanced interrogation didn’t work is that’s the only way they can sell their hysterical response to the American public. Americans understand that in war we often have to test the limits of propriety to defeat the enemy and save American lives. This is especially true when fighting an enemy that utterly disregards the laws of war and builds key parts of its war-fighting strategyaround the notion that we will always and forever treat them with kid gloves. They can read army field manuals on interrogation just as easily as you can — and then specifically train their men to counter the techniques. If we reward terrorist enemies with the same kind of treatment that the laws of war reserve for uniformed members of foreign militaries, we will simply incentivize their continued violations and enable their terror plots without — and this is crucial — impressing or winning over key Middle East populations or even winning over world opinion. I cannot stress enough how much American forces have restrained themselves in this war. Friends of mine are dead because of this restraint. If you doubt the high costs of foolish restraint, read Dakota Meyer’s and Bing West’s outstanding and disturbing book, Into the Fire. Yet not only do I not see a single tear of regret flow from the face of the war’s leftist critics, I hear instead the howling, wailing lament that we were not more restrained, that we didn’t treat our murderous enemies with even more respect. The one area of this entire war where we’ve pushed the limits is the enhanced interrogation of a handful of suspected terrorists who we believe had possessed actionable intelligence that could save American and allied lives. And this is a stain on American honor? Spare me. It is far more morally consequential that we’ve let down our own men and women in uniform by tying their hands far beyond the requirements of the laws of war, by demanding that they lay down their lives and bodies often without giving them the right tactical tools to win the battles they’ve been ordered to fight. Our restraint has not earned us the respect of our enemies. They laugh. It has not earned us the respect of our friends in the Middle East. They’re desperate for protection. It won’t even earn us the respect of the professor or pundit class, because their disgust at American power and its influence is already fixed. But this release of information does earn us contempt. And, no, I’m not talking about the contempt of the editorialists of the New York Times and their friends and allies. I’m talking about the contempt of foreign allies who know that cooperation with America now carries risks of shame and embarrassment. I’m talking about the contempt of enemies who see that domestic pressures are acting like a one-way ratchet against the effectiveness of American armed forces. This contempt makes us weaker and places Americans at needless additional risk. Empowered terrorists dealing with timid allies and an excessively-restricted American military are unquestionably more dangerous. I’m not arguing that there should be no limits on American freedom of action in the war against jihadists. As noted above, some of the incidents described in the terror report (if true) are disturbing and likely illegal. I’m not going to excuse lying to Congress. But I’m also not going to excuse how some members of Congress selectively and misleadingly use and release classified information to advance partisan and ideological arguments. Let’s be clear about the trends here: The Left is slowly but surely arguing for a set of legal restrictions and military practices that make it extraordinarily difficult for America (and Israel) to wage war against jihadists. The Left has long argued that actions against terrorists should be more like law enforcement and less like war. This is an unpopular and ineffective argument (and one without international legal foundation). So what is their response? To try to change international legal doctrines and norms to the point where a law enforcement approach is essentially mandated. This is pacifism through lawfare, but it’s a pernicious and strange form of pacifism, because it’s never applied to our enemies. America has never fought a war perfectly, and it never will. But the history of our arms and government in war is largely one of courage and honor, and this war is no exception. The “torture report” should not stain America, but it should stain those who twist reality for their own partisan ends — without sufficient regard for innocent American lives or the innocent lives of our friends and allies. Posted at NationalReview.com on December 10, 2014. Reprinted here December 11, 2014 for educational purposes only. May not be reproduced on other websites without permission from National Review. Visit the website at NationalReview.com. 2. The purpose of an editorial/commentary is to explain, persuade, warn, criticize, entertain, praise or answer. What do you think is the purpose of David French’s editorial? Explain your answer.